Nebraska’s tattoo artists are crafting up some of the most beautiful masterpieces in the country. Their designs and styles will mesmerize you, whether original or of your choosing. 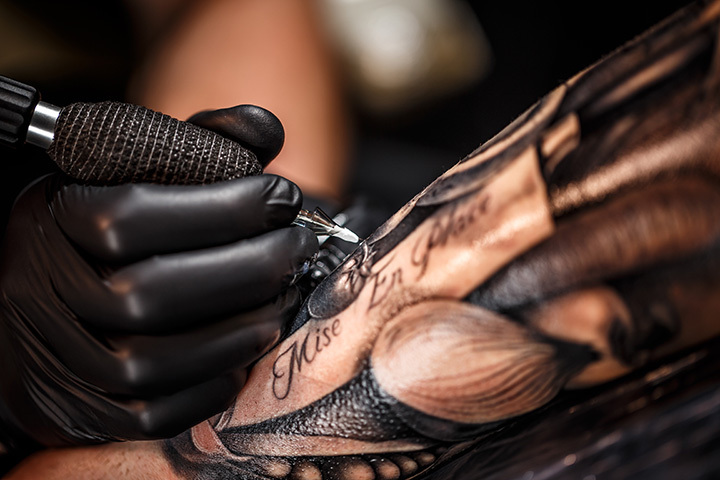 It doesn’t matter if you’re looking for blackwork, color, realistic, or geometric, these 10 awesome tattoo parlors in Nebraska will help you out. Grinn & Barett is owned by Jeremiah Connor, who is also a tattoo artist. Connor's interest in body art started at a young age, when he used to draw on himself as a child. On the Grinn and Barett website, you can check out his impressive collection of tattoo masterpieces he's done in the past. The shop has received several accolades, including the "Best of the Big O" by Reader Magazine and "Best of Omaha" by Omaha Magazine. Absolute Tattoos and Body Piercing is owned by two military veterans Dan and Anna. Their shop is known for their extremely high quality work and very reasonable pricing. A great atmosphere and cleanliness make this the perfect tattoo shop. Liquid Courage has been around since 2000 and has rated as the best shop in Omaha for over 13 years. Owners Devin and Johnna are both very experienced artists that will ensure you are happy with your newest addition. Tenth Sanctum Tattoo is a clean and professional tattoo shop known for their attention to detail and friendliness in working with customers. They will help guide you to designing and answering all your questions to make sure you leave extremely happy with your tattoo. Seth and his team at Villain’s Tattoo have been offering superior quality tattoos since 1994. All of their artists have over a decade of experience and indisputable skill to give you the tattoo of your dreams. You will not be disappointed if you choose to visit Rays Tattoo. Their shop began over 30 years ago and has been a staple in the area for producing amazing quality work at great prices. They pay attention to customer’s desires and will help produce custom one-of-a-kind pieces. Iron Brush tattoo shop has been around since 2002 and has a crew of tattoo artists that have a ton of desire and dedication to the art of tattooing. They continually push the standards for excellence and create beautiful body art. Big O Tattoo has many passionate and experienced tattoo artists that will help you figure out the perfect tattoo for you. They’ve been open since 1999 and have consistently been known as one of the best tattoo parlors in the area. Smokin Joe’s Tattoo is one of the oldest and best tattoo shops in Grand Island. They will ensure you are comfortable and their attention to detail is unmatched. You will have a great experience here whether you opt for some new ink or a body piercing. Revolution Custom Tattoos is known for their extremely skilled artists who will help you design a custom tattoo just for you. They also are very experienced in repairs and cover ups. They have a clean and comfortable space and offer a very professional experience.